This afternoon, I contacted American blogger and journalist Curt Hopkins after receiving an email from Kathryn Corrick, Online Manager at the New Statesman (a UK magazine on political, cultural and current affairs) telling me to cut the majority of a post entitled "In Darfur, Sudan 700,000 people rely on Oxfam to survive" published here at Sudan Watch 2 June 2005. UNITED NATIONS, June 28, 2005 (AP) via Sudan Tribune -- The conflict in Sudan's western Darfur region will not be settled until disputes over land ownership and animal grazing rights are resolved, the U.S. aid chief said. "Unless we deal with the land issue, and the grazing rights issue in Darfur, there isn't going to be a resolution of the political stalemate," he warned. 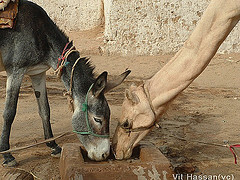 "Loss of livestock hurts eastern Sudan tribe"" - report. KHARTOUM, June 28, 2005 (Sudan Tribune) -- Darfur rebels have attacked an Antonov plane belonging to the UN in Labadu area in Southern Darfur State in western Sudan. The plane was on its way from Khartoum to the capital of Southern Darfur State, Nyala. The state police commissioner, Gen. Abidin al-Tahir, said 30 UN officials, including some Sudanese nationals, were on board of the aircraft. However, he added, the plane was able to land safely at Nyala Airport and no casualties had been reported. He further said an investigation into the incident was now under way. He explained that in their preliminary statements, the passengers had said the plane had been shot at from the ground but only one of its windows had broken. He affirmed that investigations would continue: "We are now waiting for a report from the Civil Aviation technical body of investigation", he added. For his part, the armed forces spokesman, Gen Abbas Abdelrahman, said no armed forces were present in the area where the incident took place and the people who had carried out the attack were thought to be outlaws. Material provided by the BBC Monitoring Service. Sudan planes 'bomb' rebel forces in eastern Sudan? Not sure how much truth there is to this BBC report: Sudan planes 'bomb' rebel forces. Boston Globe opinion piece by Ketumile Masire has an eyecatching title "Africans must save Darfur." Sir Ketumile Masire was president of Botswana from 1980 to 1998. The piece is great in theory but with an oil rich country like Sudan presided over by Arabic dictators who hang on to power at any cost, no matter if the cost exceeds the loss of well over two million lives, how can Africans overcome the obstacle of sovereignty? It is easy to say the African Union should increase its troops and expand its mandate in Darfur but how can it be done when Sudan's dictators reject offers of help and refuse an expanded mandate for African Union troops? Khartoum says an expanded mandate would be perceived as an occupying force and cause more violence. More than likely they see it as a threat and fear being overthrown. They stole power from a democratically elected government. Nobody voted them in. With only nine days left before the Live 8 concert is beamed to billions of people around the globe on July 2, things are hotting up here publicity wise in Britain. The countdown is beginning to the greatest concert on Earth. There are just 14 days to go before the G8 Summit takes place at the Gleneagles Hotel in Scotland, UK July 6-8. Click here to find out more, including where the concerts are taking place, how to get tickets and who is performing. Note, there may be arrangements to allow hundreds of thousands more into the London concert at Hyde Park on the day. LONDON, June 18, 2005 (Al-Sharq al-Awsat) -- Fundamentalists in London say that the unprecedented attack on the Sudanese government by Ayman al-Zawahri, the number one ally of the leader of Al-Qaida Organization Osama bin Ladin, in his new tape that was broadcast by the Qatari satellite channel Al-Jazeera yesterday (June 17) was due to Khartoum's handing over to Washington of files on Al-Qaida's leaderships. Photo: Ayman al-Zawahri - see further details at Wikipedia. Hani al-Subaie the director of Al-Maqrizi Research Centre in London told Al-Sharq al-Awsat "Khartoum has turned over files with photographs for most of the leaderships of Al-Qaida and the Egyptian Jihad" who used to live in the Sudanese capital until they broke off and left Sudan in 1995. He said that most of the fundamentalists who lived in Khartoum used fictitious names or forged passports for security reasons, but the Sudanese government knew their identities by virtue of a special agreement between the security bodies and the leaders of the Islamic groups. Ayman al-Zawahri, the number two man in Al-Qaida Organization criticized "the American visualization of reforms" and attacked, according to the tape, the Sudanese, Saudi and Egyptian governments according to what the channel cited. Material provided by the BBC Monitoring service - copy via Sudan Tribune. June 20, 2005 report by Scott Shane "CIA meeting with Sudan security chief angers some in U.S," New York Times via International Herald Tribune. June 19, 2005 report by Ken Silverstein "Sudan intelligence chief's visit stirs internal debate in D.C.," Los Angeles Times via Seattle Times. Sudanese intelligence visitor split US officials - A decision by the CIA to fly Sudan's intelligence chief to Washington for secret meetings aimed at cementing cooperation against terrorism triggered such intense opposition within the Bush administration that some officials suggested arresting him here, sources said. See full report via Sudan Tribune by Ken Silverstein, Los Angeles Times, June 17, 2005. U.S. probes reported Sudan link to terror - U.S. intelligence and security agencies are investigating reports that Sudan's government has renewed its covert support for al Qaeda and other Islamic terrorists, The Washington Times has learned. See full report by Bill Gertz, The Washington Times, June 17, 2005 via World Peace Herald. May 2, 2005 Sudan Watch post - scroll down to read "CIA supports genocide in Sudan?" April 29, 2005 Sudan Watch post - scroll down to see "US Report: Sudan Proves Ally in U.S. War on Terrorism" by Ken Silverstein LA Times: despite once harbouring Bin Laden, Khartoum regime has supplied key intelligence, officials say. The Times said US government officials had confirmed that the CIA flew the chief of Sudan's intelligence agency to Washington last week for secret meetings, sealing Khartoum's sensitive and previously veiled partnership with the administration. The newspaper said Sudan had detained al Qaeda suspects for interrogation by US agents, given the FBI evidence seized from raids on homes of suspected terrorists, handed over extremists to Arab intelligence agencies and foiled terrorist attacks against US targets. The paper cited interviews with American and Sudanese intelligence and government officials. Sudan has "given us specific information that is ... important, functional and current," said a senior State Department official speaking on condition of anonymity. The chief of Sudan's Mukhabarat intelligence agency, Maj. Gen. Salah Abdallah Gosh, told the Times: "We have a strong partnership with the CIA. The information we have provided has been very useful to the United States." Sudanese Foreign Minister Mustafa Osman Ismail acknowledged in an interview that the Mukhabarat already had served as the eyes and ears of the CIA in neighboring countries, including Somalia, a sanctuary for Islamic militants. BBC news: Who is Osama Bin Laden? On December 18, 2003, CNODC signed Stock Purchasing Agreement with Switzerland Cliveden Corporation in respect of the risk exploration at Block H. Canadian EnCana Corporation is the operator of the block. Block H is located in Chad Republic in middle Africa. That night, 18 December, marked a victory for China in the scramble for Africa. The banquet, with guests including Felter [Eronat's friend and legal counsel since the mid 1990's] and Chinese State officials, was held in the basement, three storeys below a Chelsea street. In the impoverished nation of Chad, Eronat had landed a huge exploration concession - the "Chad Convention" - potentially holding 10 billion barrels of oil. The party was to toast a deal in which oil-hungry China bought a stake in this. It was a big move for the Chinese. Chad recognises China's enemy Taiwan, and the Chad initiative was part of a political strategy (Eronat facilitated introductions between the Chad and Chinese governments), thought to have been approved by the Chinese prime minister. The deal was important enough for one of the most powerful men in China, Wang Jun, chairman of Citic, the $60 billion State-owned corporation, to fly to London to sign. Together with Chinese oil firm CNPC, they purchased a $45 million, 50 per cent share in Cliveden. The deal was initialled there and then in Eronat's house. Amid the popping corks, Felter privately reminded his boss there could be a problem. Cliveden's other 50 per cent holding had been sold the year before to Canadian oil and gas company EnCana for $46.5 million, in a deal clinched by Felter. He believed EnCana was legally entitled to be informed about its new partner. According to Felter, Eronat wanted to keep it quiet. In January 2004, Felter notified EnCana about China's involvement. Eronat was apparently "furious". By mid-February, following a shareholders' meeting in Beijing, Felter was relieved of his duties. Felter, who argues he put Cliveden on track to become a $1.2 billion entity, says he was sacked because he told EnCana about the Chinese. Cliveden maintains there was no legal requirement to inform EnCana, and the company acted correctly. EnCana would not make any comment to the Standard about the dispute but is now said to be pulling out of Chad. Felter had been dealt a bitter blow. As Eronat's friend and legal counsel since the mid-Nineties, he says that, in trying to do "the right thing", he had acted "out of misplaced loyalty". It must have been all the more galling since he had loyally shielded his client, he stated, startlingly, "against being indicted in the US for fraud and moneylaundering". According to Adrian Gatton's report Secret World of the Chelsea Oil Tycoon in London's Evening Standard May 26, 2005 Jean-Gabriel Antoni, Friedhelm Eronat's Geneva based financial manager, told an employment tribunal [brought by Eronat's former legal counsel Dr Peter Felter] that Eronat's British Virgin Islands-registered Cliveden, which in 2003 posted net profits of $63 million, is "not making tax returns anywhere". Thanks to a reader for emailing a report published on June 17, 2005 by Alsahafa news. A photo from the report, copied here below, shows Eronat's Geneva based financial manager, Jean-Gabriel Antoni, in his grey suit (on the left, almost trying to get out of the picture) signing the Darfur oil deal with Sudan's energy minister Dr Awad Ahmad al-Jaz. The agreement was signed between the Ministry of Energy and Mining and a group of [oil] companies including the Swiss company, Cliveden, which has a 37 per cent share; High Tech, with 28 per cent; the [national] Sudanese [oil] company, Sudapet, with 17 per cent share; Khartoum State, with 10 per cent; and the Hejlij Company with 8 per cent share. In a press statement after the signing of the agreement, the minister of energy and mining, Dr Awad Ahmad al-Jaz, said these companies had extensive expertise in the oil industry. He added that the presence of the Swiss company Cliveden was going to give a strong impetus in this field. Note, Western oil companies like Talisman did not pull out of Sudan so that other Western companies could step in and exploit Darfur. Companies like Cliveden say violence is not occurring within concession areas, but fail to explain that oil revenues are funding the regime in Khartoum which has been at war ever since it stole power through the gun barrel. Who knows what human rights abuses have been committed to make way for oil exploration, drilling and the laying of pipelines? Trouble is poor people, such as those in Darfur, do not seem to have land and property ownership rights. Talisman Energy Inc., Canada's largest independent oil producer, must defend a case accusing it and the Sudanese government of genocide, a judge said as she turned aside a second bid to dismiss the lawsuit. U.S. District Judge Denise Cote in New York said there wasn't a legal basis to dismiss the four-year-old suit, which accuses Talisman of helping Sudanese officials bomb churches, kill church leaders, and attack villages to clear the way for oil exploration. See full report by The Financial Post at Sudan Tribune June 15, 2005. "Other sources of foreign investment include the United Kingdom, South Korea, Holland, Egypt, Sudan, Libya, and Taiwan. A Swiss company, Cliveden, is investing in oil exploration with a Canadian partner, EnCana. A South Korean company, AFKO, has invested in a gold mining venture in southern Chad. A Dutch company, MSI, and a Swedish Company, Millicom International Cellular (MIC), have invested in cellular telephone services. Libyan companies have increased their investments in Chad over the past several years, particularly in hotels and real estate." In December 1999, Trinity Energy Resources Inc. (Trinity) (OTCBB:TRGC), original operator and 70% working interest owner of the 108 million acre Permit H Concession in the Republic of Chad, entered into a Farmout Agreement with Swiss-based Cliveden Petroleum Co., Ltd (Cliveden). The Farmout Agreement assigned 65% of the original 70% working interest to Cliveden and allowed Trinity a 5% back-in working interest after payout of project expenses. Upon execution of the Farmout Agreement with Trinity, Cliveden carried forward with obligations associated with concession exploration and development. In addition to other concession exploration activities, Cliveden has acquired approximately 1250 line miles of seismic data, consistent with obligations of the concession. Countries that are rich in natural resources are often poor because exploiting those resources takes precedence over good government. Competing oil and mining companies, backed by their governments, have often been willing to deal with anyone who could assure them of a concession. This has bred corrupt and repressive governments and armed conflict. In Africa, civil wars have devastated resource-rich countries such as Congo, Angola and Sudan. In the Middle East, democracy has failed to materialise. Lifting this resource curse could make a large contribution to alleviating poverty and misery in the world, and there is an international movement aimed at doing just that. The first step is transparency; the second is accountability. The movement started a few years ago with the Publish What You Pay campaign, which urged oil and mining companies to disclose payments to governments. In response, the British government launched the Extractive Industries Transparency Initiative (EITI). On Thursday, three years into the process, the UK will convene an important EITI conference in London, to be attended by representatives of governments, business and civil society. James Norman, in his article at Platts Oilgram News 7/12/2004 entitled "Eronat escapes Kazakhgate" explains that Friedhelm Eronat: "the notorious oilman, cut a deal to avoid prosecution in the Giffen case, even though the US claims his 'assetless shell company' Vaeko was key to Mobil's scheming for a piece of the giant Tengiz field." See report by Justin Raimondo: Nurturing Nursultan Nazarbayev's Central Asian empire of corruption - a 'vital' U.S. ally. The Price of Oil: What Was Mobil Up to in Kazahstan and Russia? -- The fall of 1997, an international businessman named Farhat Tabbah filed suit in London against three American businessmen, the oil minister of Kazakhstan, and a subsidiary of the Mobil Corporation. He charged that they had cheated him out of millions of dollars in commissions on what was to have been a ten-year swap of oil between Kazakhstan and Iran. Mobil and the other defendants denied the allegations and successfully moved to suppress all Tabbah's affidavits and supporting documentation. A few months after Tabbah filed his lawsuit, he flew to the United States and gave his account of the swap plan to federal authorities. He also turned over several file drawers of documents, including internal Mobil faxes and memos, to agents of the United States Customs Service. -- In Mobil's case, the company's in-house investigators came to believe that the proposed swap between Kazakhstan and Iran was but one element in a complex of seemingly high-risk business deals that were devised by Bryan Williams. The investigation also led to the two other Americans named in Tabbah's suit: James H. Giffen, a New York merchant banker and adviser to Kazakhstan's President Nazarbayev; and Friedhelm Eronat, a businessman who often acted on behalf of Mobil overseas. The business dealings and friendships among the three men date back many years, and they have done billions of dollars' worth of deals worldwide. The three might never have become the focus of grand-jury scrutiny if they hadn't fallen out with Farhat Tabbah. -- In a speech in The Hague at the end of May, John Ashcroft, the U.S. Attorney General, said. "We must come to a recognition. Personally and culturally, that corruption is not just a violation of the taw, not just an economic disadvantage, and not merely a political problem, but that it is morally wrong." It should be "no longer seen as an accepted cost of doing business," he went on. "It is now widely recognized that the consequences of corruption can be devastating: devastating to economies, devastating to the poor, devastating to the legitimacy and stability of government and devastating to the moral fabric of society." Ashcroft's concerns apparently are not shared by all in the international oil community. It may never be known why Mobil's leadership exercised so little oversight on the executives who dealt with Russia and Kazakhstan, and whose activities posed such enormous legal and financial risks. Indeed, the actions alleged in connection with the Tabbah case "bet the company," in the words of one person close to the Mobil investigation, "with maximum criminal and civil exposure." This person has concluded that people in the industry believed that the importance of oil in the national and world economy would insulate them from any complaints of wrongdoing. He summed up the oilmen's attitude this way: "What's man afraid of? The cold and the dark. We make it warm and we make it light." What did the British Government know about Eronat before he became a 'Briton'? The Darfur rebellion started around February 2003. It was not widely reported until April-June 2004 when the death toll was reported as 10,000 and news was being circulated that the Sudanese government was bombing, slaughtering and burning civilians' villages to quash the rebellion and drive the people from their homes. The slaughter in Darfur started in earnest around February/March 2004. Since February 2003, it is estimated 300,000 - 400,000 Darfurians perished and at least 1.5 million have been displaced. The UN's World Food Programme (WFP) recently predicted six million people across the Sudan are now in need of food aid. ReliefWeb reports today WFP announced Friday June 17, 2005 that about 3.5 million people, more than half of the entire population of western Sudan's Darfur region would need food aid in the coming hunger season. The man behind Cliveden is former U.S. citizen Friedhelm Eronat, an ex-business partner of convicted Mobil dealmaker J. Bryan Williams and an unindicted co-conspirator in the U.S. Justice Department's pending James Giffen Kazakh bribe case. As Mr Eronat, recently acquired British citizenship, news reports now refer to him as a "Briton". His company called Cliveden, registered in the British Virgin Islands, is referred to as "British." Eronat's wife, Melisa Lawton who attended Sherborne School for Girls in England 1985-87 may be British which would have helped him acquire a British passport. One wonders though how he acquired British citizenship so quickly, especially considering he has a U.S. court case hanging over his head. It is galling to think of Eronat leeching off Britain's credibility and respected reputation abroad. When it comes to Immigration and taxation, it seems like there is one rule for all, but an altogether different and unspoken rule when one is a millionaire or working in government at taxpayers' expense where the rules can be bent to suit. It would be interesting to know what the British Government knew about Eronat's business affairs before they granted him a British passport and citizenship. See map showing the current concessions of oil exploration and production activities in Sudan, courtesy website of Sudanese Embassy in The Hague, Netherlands. Hover your mouse over the blocks - and note the empty blocks. LONDON, June 17, 2005 (Dow Jones) -- White Nile Ltd, the AIM listed oil & gas exploration company 50% owned by the New Government of South Sudan, said Friday that Terra Seis Geophysical Ltd, a wholly owned subsidiary of Terra Seis International, has been awarded the contract to conduct an extensive seismic evaluation programme of White Nile's 65,000 sq km Block Ba oil licence area in South Sudan. The company said that Calgary based Terra Seis has been commissioned to acquire 2,000 km of high resolution geophysical data focussed on a high definition seismic programme. The 10 month project, which will start immediately, will primarily focus on the areas within Block Ba thought to be highly prospective i.e. the extensions of the Melut and Muglad Basin areas. It said that these Basins already have oil production to the north of the Block Ba concession area. Terra Group of Companies Chairman Kevin Plintz said: "We are already organising the transportation of teams and equipment and expect the data acquisition process to be completed by June 2006." LONDON, June 16, 2005 (Dow Jones) -- White Nile Ltd. (WNL.LN) Thursday said its shareholders have cleared the terms of an acquisition of a South Sudanese oil block which includes a reverse takeover of the company by state-owned Nile Petroleum Corp. In a statement, London-listed oil minnow White Nile said an extraordinary general meeting of shareholders backed the acquisition of an interest in a petroleum concession in Block Ba from Nile Petroleum. Nile is owned by the autonomous government of South Sudan. It said the acquisition was in exchange for 155,000,000 ordinary shares of 0.1 pence each to Nile Petroleum, the equivalent of 50% of White Nile's capital. The company had disclosed the deal's terms May 19. White Nile said the shares allotted to Nile Petroleum are subject to a 12-month lock-in agreement from the admission date, which is due Friday. The contract signed by White Nile, which was co-founded by former England cricket-player Phil Edmonds, is disputed by French oil major Total SA (TOT). Total has been granted the same block by Sudan's central government. "In 2003, the Sudanese Government awarded block 8 in eastern Sudan to Petronas; the company would operate in tandem with Sudapet and High Tech Group of Sudan. In October, the Government awarded block C to a joint venture of Cliveden Petroleum Co. of Great Britain, Sudapet, and the Government of Khartoum Province." Sudanese energy minister denies Western firms unwilling to invest in oil sector - BBC Monitoring Africa, Oct 09, 2003 via Sudan Tribune -- Sudanese Energy Minister Awad Ahmad al-Jaz has denied Western companies are unwilling to invest in Sudan due to pressure from Washington. In an interview with the London-based Arabic newspaper, Al-Sharq al-Awsat, Al-Jaz said many Western companies remain engaged in Sudan's oil sector and continued to openly bid for new concessions. The following is the text of the interview published by London-based newspaper Al-Sharq al-Awsat on 7 October; all subheadings inserted editorially. Click here for full report. Sudan hopes to boost oil production to 500,000 b/d in 2005 - Report dated November 30th, 2003 by Muhammad Abu-Hasbu, Al-Hayat [via BBC Monitoring Middle East]: -- Sudanese Energy Minister Awad Ahmad al-Jaz has said the country hopes to raise its oil production to 500,000 barrels per day in 2005. Al-Jaz disclosed this in an interview with Muhammad Abu-Hasbu of Al-Hayat. The following is the text of the interview published on London- based newspaper Al-Hayat on 25 November; all subheadings inserted editorially. Click here for full report via Sudan Tribune. Report by Ruth Gidley Reuters June 15, 2005. Note, error in the report refers to ABCO instead of APCO. APCO (Advanced Petroleum Company) is a joint venture between Cliveden (37%); High Tech Group (28%); Sudan Petroleum Corporation (17%); State of Khartoum (10%) and Hejlij Co (8%). Sudan hopes to seal a deal with Malaysia's Petronas next month on building a new 100,000 barrel per day (bpd) refinery, allowing it to use rising domestic production, its oil minister said on Tuesday. Full report by Reuters via Sudan Tribune, June 14, 2005. Photo: Khartoum Refinery produces 75% of Sudan's energy requirements, and has plans for further growth. Chinese integrated oil giant PetroChina has pre-emptive right to acquire upstream assets held by its parent, state-owned China National Petroleum Corp, in Sudan, the company's chief financial officer Wang Guoliang said Friday. In a media briefing Friday announcing the company's agreement with CNPC to buy the latter's overseas oil and gas assets under a newly formed joint venture, Wang said both companies agreed not to include the Sudanese upstream assets in their deal after studying this possibility for some time because of the "sensitive" nature of the matter. Full report by Platts via Sudan Tribune, June 10, 2005. On June 16, BBC news reported on a rare video footage shown on UK Channel 4 news the previous night. The film was shot in China by a resident with a digital camera. It was then handed to a reporter from the Washington Post. I watched the Channel 4 special report. Riots are on the increase in China but are rarely filmed. Trouble stems from an increase in China's creativity and productivity which is causing the country to "overheat". It is facing increased demand for energy and shortages in supply. The video footage showed a shocking riot in China not far from Beijing. To clear land and make way for a power plant, peasant farmers were set upon and beaten by a marauding gang of thugs hired by local officials to drive the farmers from land they had squatted on. According to the BBC report from Beijing by Daniel Griffiths, the eviction of local people to make way for new developments is becoming one of China's sharpest social issues. Re the video, he said the pictures showed local farmers fighting a pitched battle with dozens of unknown men wearing camouflage gear and construction helmets. Hunting rifles and clubs were used in the bloody clashes in the northern village of Shenyou. Chinese state media said that the residents had been resisting the takeover of their property by an electricity company which wants to build a power plant there. According to both reports, violent disputes like this one are common in China, where competition for useable land is fierce. In China, six villagers have been killed and 50 injured in a dispute over land. Channel 4 News's Asia correspondent Ian Williams reports. The attack came at dawn, hundreds of men armed with shotguns and clubs, rampaging through tents erected by the protesting farmers. Although rural unrest has been growing in China, this was one of the deadliest incidents seen in years and one of the first to be captured on video. It left at least six dead and a hundred wounded. The farmers, who were occupying disputed land, tried to defend themselves but were beaten back by volleys from hunting rifles and flare guns. It happened last weekend, about a hundred miles southwest of Beijing, where farmers had been resisting plans by the local authorities to build a storage facility for a state-owned power plant. They suspect the assailants were hired by corrupt local officials to drive them off the land, many wore hard hats and military fatigues, lashing out with long pipes fitted with sharp hooks on the end. The police ignored calls for help from the farmers, one of whom shot this video with a digital camera, handing the tape to a reporter from the Washington Post. Much of rural China has missed out on the country's economic boom. There is a massive wealth gap between the countryside and the booming coastal regions and the simmering rural discontent is one of the biggest challenges facing the government. Recent mining accidents have sparked riots and corruption, pollution and land seizures have also provoked anger. The protests are growing in number and intensity. According to Beijing's own figures, there were 58,000 protests involving 3m people in 2003, the last year for which figures are available. China's insatiable demand for energy may have contributed to the authorities eagerness to evict the farmers last weekend. The country is facing a severe power shortage, and the farmers were obstructing the local plant's expansion plans. The rural unrest is very different from the large anti-Japanese protests and riots seen in major Chinese cities in April. These were condoned by the government, though after a week of this the authorities did act, fearing the mobs were getting out of control and might soon find other targets for their anger. Nothing worries Beijing more than instability, and the countryside is providing plenty of that. Remarkably this clash has been reported in at least one Beijing newspaper. In spite of the attack, the farmers still control the disputed land. In a recent post, Reporters Without Borders said it was disgusted to find that Microsoft was censoring the Chinese version of its blog tool, MSN spaces, the system automatically rejecting words including "democracy" and "Dalai Lama". Reporters Without Borders said it had been able to check, as reported by several news agencies, that when a Chinese blogger attempts to post a message containing terms such as "democracy", "Dalai Lama", "Falungong", "4 June" (the date of the Tiananmen Square massacre), "China + corruption", or "human rights", a warning displays saying, "This message contains a banned expression, please delete this expression." Full story June 14, 2005. Note, today Rebecca MacKinnon says she has experimented setting up a blog using the MSN Spaces Chinese interface and concludes the filtering of MSN Spaces China appears limited to the blog's title only -- titles of individual posts and within the body of posts do not appear to be filtered. June 16, 2005 report by Benoit Faucon (Dow Jones) -- White Nile Ltd. (WNL.LN) Thursday said its shareholders have cleared the terms of an acquisition of a South Sudanese oil block which includes a reverse takeover of the company by state-owned Nile Petroleum Corp.
See full report at SudanTribune. British Minister for International Development Hilary Benn arrived in Sudan Monday June 13. He met with SPLM officials in Rumbek, southern Sudan to discuss implementation of the peace agreement and visited Darfur to get acquainted with the security and humanitarian situations there. LONDON, June 13, 2005 (Sudan Tribune) -- A small, but highly capable, package of military assistance was announced today by the Defence Secretary John Reid to assist the African Union (AU) peacekeeping mission in Darfur. "I am greatly heartened to see NATO and the EU working closely together to provide real, practical assistance to the African Union's mission to end the suffering in Darfur. "The UK has an important role to play in this, and I am very pleased to be able to offer this assistance." Fifteen personnel from the Royal Air Force's Mobile Air Movements Team, based at RAF Brize Norton, are likely to deploy to Nairobi, Kenya, as part of NATO's efforts to coordinate and enable the airlift of additional battalions of AU troops. The team will play a key role in ensuring that the African peacekeepers are safely, effectively and quickly deployed into theatre. The UK will also deploy two logistics experts, as part of the EU's assistance programme, to help ensure the troops are able to sustain their support infrastructure in the challenging conditions of Sub-Saharan Africa. These officers are expected to serve with the African Union's forward headquarters in El Fashir, Sudan. A UK officer, currently serving in European Airlift Centre at Eindhoven, will deploy to Addis Ababa, Ethiopia, to assist the air movement of the expanded mission of the AU, EU and NATO contributions. The UK strongly supports the expansion of the African Union mission in Darfur and will continue to work with NATO, the EU and the UN to identify what assistance can be provided to support the AU's objectives. The British Ministry of Defence is also working closely with the Department for International Development. This announcement follows a UK pledge at the International Donor's Conference in Addis Ababa on 26 May 2005 of £6.6 million for the provision of additional vehicles, equipment and shelters, and to support civilian policing. The UK has also provided a small number of planners, who have provided technical expertise and advice to the AU on movement and logistic requirements. Further British support, including equipment, supplies, and advice, will continue on a case-by-case basis. NAIROBI, 17 June (IRIN) British funding for AU mission in Darfur increased - Britain has raised its contribution to the African Union's peacekeeping force in Darfur to GBP 19 million (US $34.65 million) to enable the pan-African body to expand its mission. Mr Hilary Benn said veteran Sudan specialist Alan Goulty had been appointed Britain's special representative for Darfur. "He will support the AU-led work to achieve a durable political settlement to the Darfur conflict, keeping in regular contact with all the main parties." Full story by AFP June 14, 2005 via Sudan Tribune. British Minister urges Sudan to resolve Darfur crisis - report by Press Association June 14, 2005 -- Mr Benn indicated that the UK could provide additional support for further increases in the size of the AU mission. "I think we may need more," he said. "But the priority now is to get those troops in as quickly as possible." Southern Sudan suffering hidden emergency-Britain - report by Reuters June 14. 2005 -- Southern Sudan, ravaged by more than two decades of civil war, is suffering from a hidden emergency and urgently needs aid, British Secretary of State for International Development Hilary Benn said on Tuesday. People in east Sudan eke out life on trickle of aid- report by Reuters Jun 17, 2005. A decision by the CIA to fly Sudan's intelligence chief to Washington for secret meetings aimed at cementing cooperation against terrorism triggered such intense opposition within the Bush administration that some officials suggested arresting him here, sources said. See full report via Sudan Tribune by Ken Silverstein, Los Angeles Times, June 17, 2005. Photo: Maj. Gen. Salah Abdallah Gosh, Sudan's intelligence chief. U.S. intelligence and security agencies are investigating reports that Sudan's government has renewed its covert support for al Qaeda and other Islamic terrorists, The Washington Times has learned. See full report by Bill Gertz, The Washington Times, June 17, 2005 via World Peace Herald. On June 15, while a UN and Sudanese team visited Darfur, Secretary-General Kofi Annan demanded that Sudan's government disarm the militias terrorising people in the region. In a report to the Security Council, Mr Annan said security is slightly better but warned that militias were still roaming Darfur. For daily news briefs on Darfur see GIF's daily summary and news reports at the Sudan Tribune. G8 the most talked about economic conference ever? Thanks to Alan Connor at Weblog Watch, BBC Magazine's review of blogs, for linking to a June 6 Sudan Watch post that I cross posted at Passion of the Present: Payback time for US on Iraq. Also, thanks Stefanie and Pundita - and for this post Ta, Britain. WASHINGTON, June 17, 2005 — A decision by the CIA to fly Sudan’s intelligence chief to Washington for secret meetings aimed at cementing cooperation against terrorism triggered such intense opposition within the Bush administration that some officials suggested arresting him here, sources said. The internal debate over the April visit by Maj. Gen. Salah Abdallah Gosh, whose government Washington accuses of committing genocide in the Darfur region, goes to the heart of a broader dispute about the CIA’s alliances with foreign intelligence services. Critics say that when the U.S. works with controversial countries such as Sudan, it suggests that it isn’t serious about promoting democracy and human rights. Many experts on intelligence matters, however, say that Washington has no choice but to rely on some governments with questionable human rights records to help fight its war against terrorism. Gosh’s agency has allowed the CIA to question Al Qaeda suspects living in Sudan and detained foreign militants moving through the country on their way to joining Iraqi insurgents, U.S. and Sudanese officials have said. The trip was intended to help strengthen the relationship. With plans for the visit on the verge of collapse, two people familiar with the situation said, a compromise was struck with opponents of the visit in the State and Justice departments. Gosh was allowed to come, but a scheduled meeting with CIA Director Porter J. Goss was canceled. The CIA, Justice Department, State Department and Sudanese government declined to comment about the dispute on the record because of the sensitivity of the relationship. But Ted Dagne, a Sudan specialist with the Congressional Research Service, said State Department officials believed Gosh’s trip would "send a political signal to the [Sudanese] government that Darfur would not prevent Sudan from winning support in Washington." The disclosure of Gosh’s visit, first reported by the Los Angeles Times, also angered some members of Congress. Members of the Congressional Black Caucus criticized the visit during a meeting with Secretary of State Condoleezza Rice on Tuesday. Rep. Donald M. Payne (D-N.J.) told a State Department official who was testifying on Capitol Hill last month that bringing Gosh "to visit Washington at this time is tantamount to inviting the head of the Nazi SS at the height of the Holocaust." A senior U.S. official, who commented officially but declined to be named, defended the visit. "Mr. Gosh has strategic knowledge and information about a critical region in the war on terror. The information he has is of substantial value to law enforcement, the intelligence community and the U.S. government as a whole, and this relationship will be of both current and future value." Gosh’s visit, the official added, did not mean that Sudan would receive "a free pass on critical policy issues" such as Darfur. Partnerships with foreign governments, known as liaison relationships, are "an indispensable part of CIA’s counterterrorism strategy," former agency Director George J. Tenet told the commission investigating the Sept. 11 attacks last year. Duane "Dewey" Clarridge, who spent 33 years at the CIA and founded its counterterrorism center, said dealing with controversial regimes is sometimes unavoidable. "You have no choice but to work with and recruit the bad guys because the Mother Teresas of the world don’t have the information you need," he said. However, others say the U.S. often ends up protecting extremely repressive regimes, including some in the Mideast. "The method of governing in the Middle East is to force your enemies to keep their heads down," said Bob Baer, a former CIA officer. Intelligence agencies there "let people know that if they plan anything against the regime, they’re going to die." The CIA inevitably becomes committed to protecting elites that offer to collaborate on intelligence, he said. The CIA’s relationship with Sudan is especially controversial because of the government’s previous ties to Islamic radicals. Osama bin Laden lived in Khartoum, the country’s capital, from 1991 to 1996, before he departed for Afghanistan. In 1993, the Clinton administration put Sudan on a list of state sponsors of terrorism, and the Bush administration has kept it there. The U.S. continues to harshly criticize Sudan for human rights violations. In September, then-Secretary of State Colin L. Powell accused Sudan of committing genocide in Darfur. President Bush reiterated that charge this month. Yet cooperation between the CIA and the Mukhabarat, Sudan’s intelligence agency, has steadily grown since the Sept. 11 attacks. "Sudan’s overall cooperation and information sharing improved markedly and produced significant progress in combating terrorist activity," the State Department said this year in a report on global terrorism. CIA and Mukhabarat officials have met regularly over the last few years, but Gosh had been seeking an invitation to Washington in recognition of his government’s efforts, sources told The Times. The CIA, hoping to seal the partnership, extended the invitation. "The agency’s view was that the Sudanese are helping us on terrorism and it was proud to bring him over," said a government source with knowledge of Gosh’s visit. "They didn’t care about the political implications." But an internal debate erupted after word of the invitation spread to other government agencies. Their concern stemmed in part from a 2004 letter that 11 members of Congress sent to Bush, which accused Gosh of being a chief architect of the violence in Darfur. The letter said Sudan had engaged in a "scorched-earth policy against innocent civilians in Darfur." It identified 21 Sudanese government, military and militia leaders as responsible and called on the administration to freeze their assets and ban them from coming to the U.S. Gosh was No. 2 on the list. Sudan’s government has rejected accusations of genocide. It says the clashes in Darfur are part of long-standing conflicts between farmers and nomadic tribes that are fueled by disputes over water, land and other resources. It denies that senior officials such as Gosh have ordered attacks on civilians, which it blames on militias operating largely beyond its control. Two senior U.S. officials told The Times that they have no direct evidence that Gosh has directed military operations in Darfur. Several sources, including a State Department official, said the question of the propriety of the visit provoked sharp divisions at that agency. Similar opposition emerged at the Justice Department, where officials discussed arresting Gosh, according to two sources. One person said Gosh learned of the discussions during his meetings with CIA officials. Despite the internal dissension, CIA chief Goss remained committed to the trip. However, sources said, he agreed to scratch his meeting with the Sudanese official. Gosh arrived here aboard a CIA jet and met with other senior agency officials April 20 and 21. The CIA canceled the meeting with Goss on the second day, saying that the director was unavailable because he needed to attend John D. Negroponte’s swearing-in to the position of director of national intelligence, a source said. Gosh returned to Sudan on April 22, again traveling in a jet provided by the CIA. Rep. Frank R. Wolf (R-Va.), who wrote to the administration this month protesting Gosh’s visit, said the CIA should not have brought him to Washington and could have arranged to meet him in Sudan or a neighboring country. "I understand that in the intelligence business you have to deal with unsavory figures, but this sends very bad signals," he said. "Unless he’s providing information that’s going to save the Western world, it’s hard to see how you can justify this." "How can the administration say that genocide is occurring in Darfur and then bring Gosh over here?" he said. "It was a dastardly and unconscionable act." Payne, of New Jersey, said he asked about Gosh’s visit in the meeting with Rice. He said she defended the visit, saying that "in situations of high stakes, there has to be a balancing and that you sometimes need to do things that you wouldn’t under normal circumstances." David Shinn, director of East African affairs at the State Department from 1993 to 1996, said the Bush administration’s engagement with the Sudanese government had produced important gains. In January, Muslim government forces in the north and Christian and animist rebels in the south agreed to end a two-decade civil war in a deal brokered by the U.S. The peace agreement will take effect next month, when a national unity government is to be formed. "Counterterrorism cooperation and ending the war with the south are pretty big deals," said Shinn, who also worked at the U.S. Embassy in Khartoum. "Engagement with Sudan is appropriate, and so is putting pressure on the government in Darfur. The two are not mutually exclusive." Shinn also said that some U.S. critics of engagement had been largely uncritical of human rights violations by southern rebels during the civil war. "A lot of people blame the government for all of the problems there," he said. "There are bad guys on the other side, too."